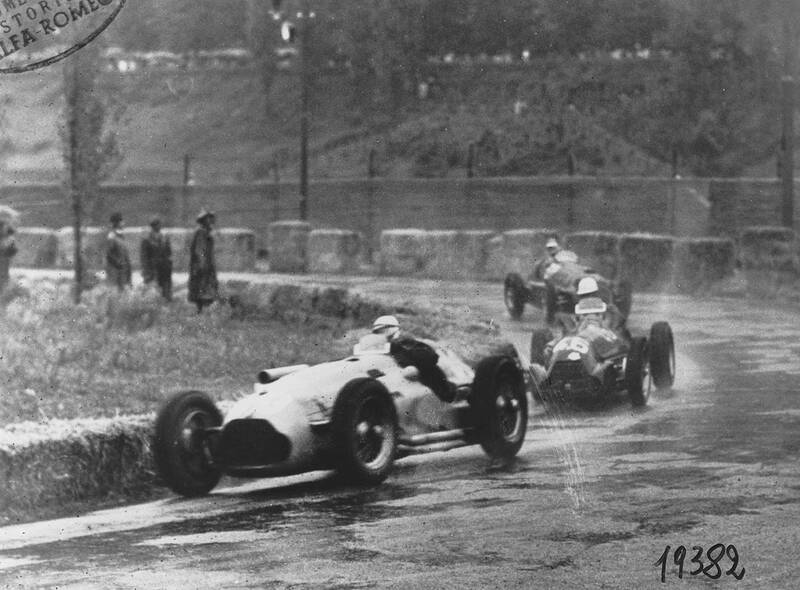 Edit: Fangio’s onboard removed. Wrong car, wrong year. 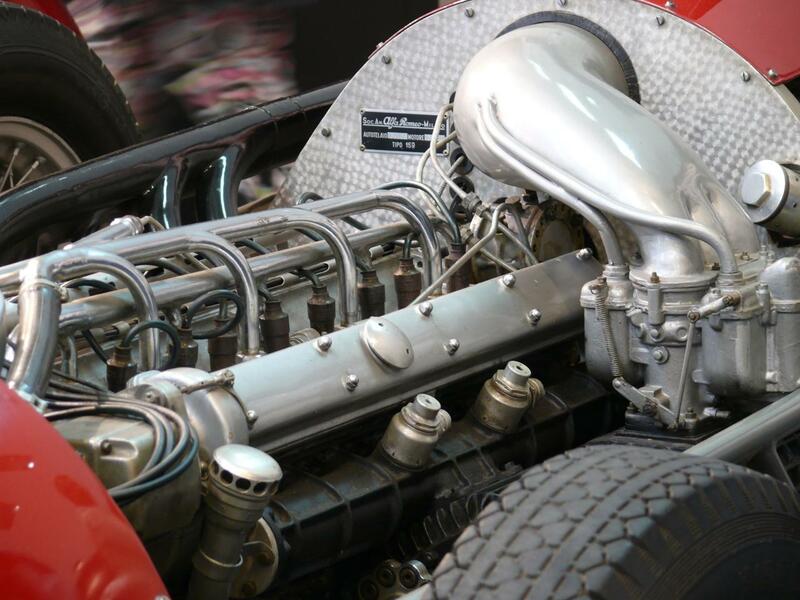 1951 Alfa Romeo 159 1.5-litre eight: This great world famous engine ‘tipo 308’ actually started life 14 years earlier in 1937. 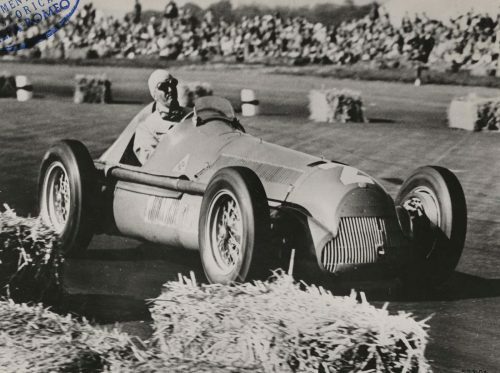 The great Vittorio Jano assistant since 1924 Gioachino Colombo and his team set about designing a new engine family comprising a straight-eight of 1.5 litres and a V16 of 3-litres. These engines were dubbed ‘308’ and ‘316’. 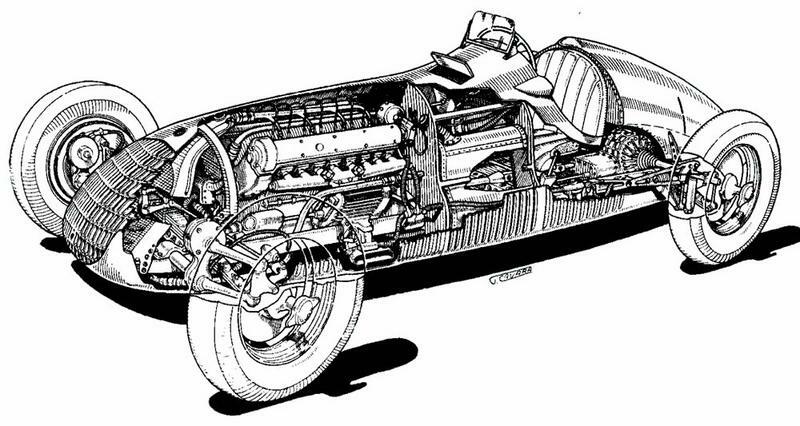 In 1937 drawings for ‘308’ were completed, the first 4 examples were assembled and tested at the Modena works of Enzo Ferrari who was Alfa Romeo racing arm, the car was given the world famous designation ‘type 158’. 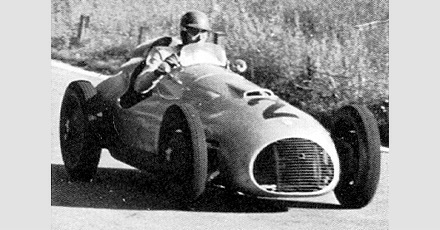 On test bed in 1938 the ‘tipo 308’ supercharged eight produced 180BHP@7000RPM on 7psi boost, when raced its output was 205BHP@7000RPM, in 1939 it reached 225BHP@7500RPM. Thereafter the ‘Alfettas’ were carefully hidden away during the war. In peacetime 1947 a 2 stage roots-type blower that had already been planned before the war was manufactured and tested. It brought power output to 254BHP@7500RPM. Power went up to 265 during that year, the following year a bigger primary blower delivered 310BHP@7500RPM, thereafter as high as 335BHP@8000RPM. 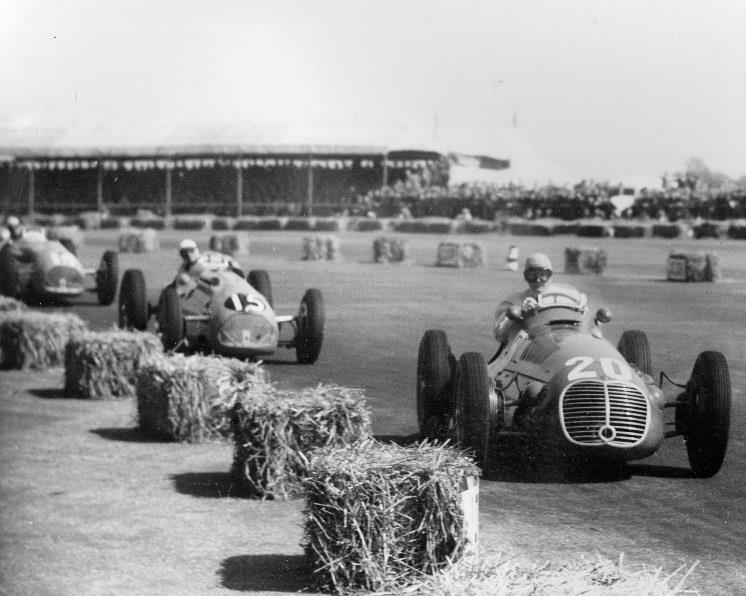 The type 158 engine ‘tipo 308’ was classic in layout and dimensions, even in 1950 the straight eight configuration remained statistically the most successful in GP racing. 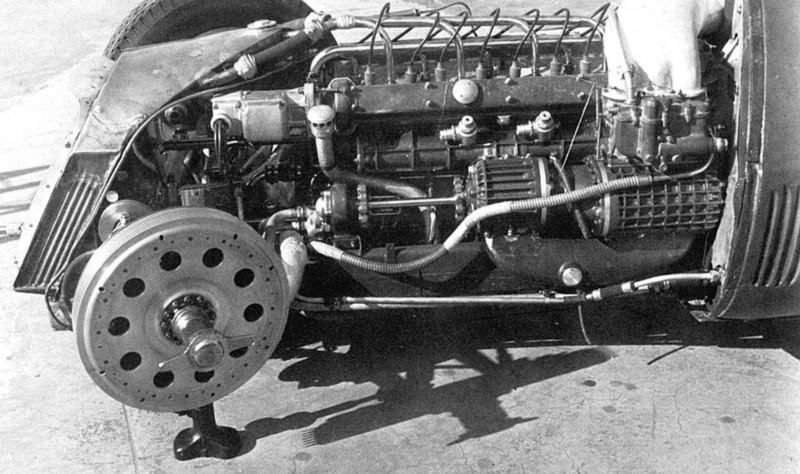 With cylinder dimensions of 58 by 70mm the Alfa had a long stroke which kept the engine short in an era when ‘square’ or oversquare were the norm, with compact combustion chambers and high velocity ports were very well suited to high supercharging and combustion pressures. Head sealing problems were avoided by combining the block and head in a single monobloc casting. This casting was of thin-wall aluminum alloy and had thin-wall screwed-in wet steel cylinder liners and shrunk-in valve seats inserts. 2 valves per cylinder were equally inclined at included angle of 100 degrees. Electron (magnesium alloy) crankcase split on crank centerline, and housing 7 plain main bearings + one outrigger bearing next to the flywheel with multi-disc clutch, I-section con-rods were used with crowded needles as big-end bearings. The gear drive to the twin overhead cams ran up from front of engine. Step-up gearing of 1.35:1 and a short flexibly-jointed shaft on the left turned the small secondary blower, which in turn was geared to the big primary Roots-type unit. 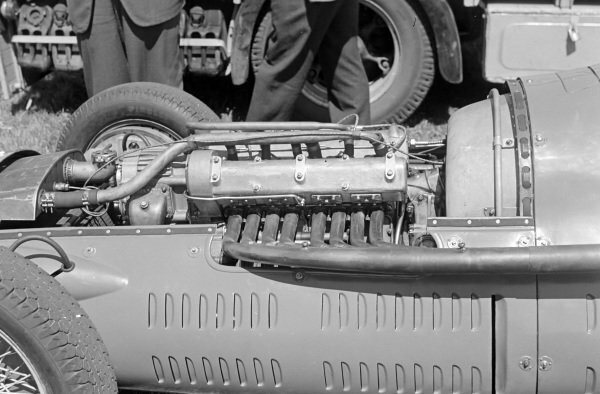 On top was a triple-barrel downdraught Weber 50 DR3C carburettor, a long ‘elephant’s trunk’ air intake drawing from below and behind the radiator, small pipes from this duct vented the float bowls to balance the fuel surface pressure with that in the inlet duct. 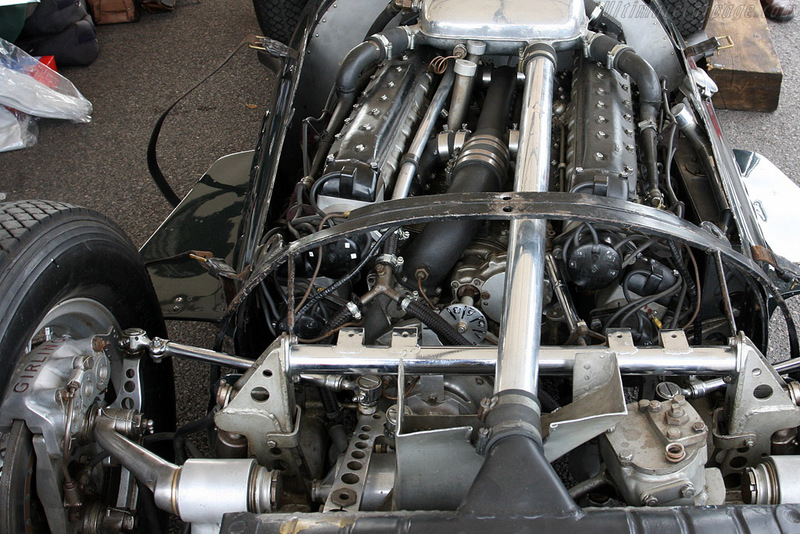 2 four plug magnetos at the camshaft noses sparked Lodge spark-plugs. Oil from the blower drive drained into the rear of the deeply finned sump which was scavenged by 2 pumps. An oil reservoir was in the car while a cooler set under the radiator, from the right ducting leading to a shroud around the exhaust manifold carrying heat rapidly away from it. 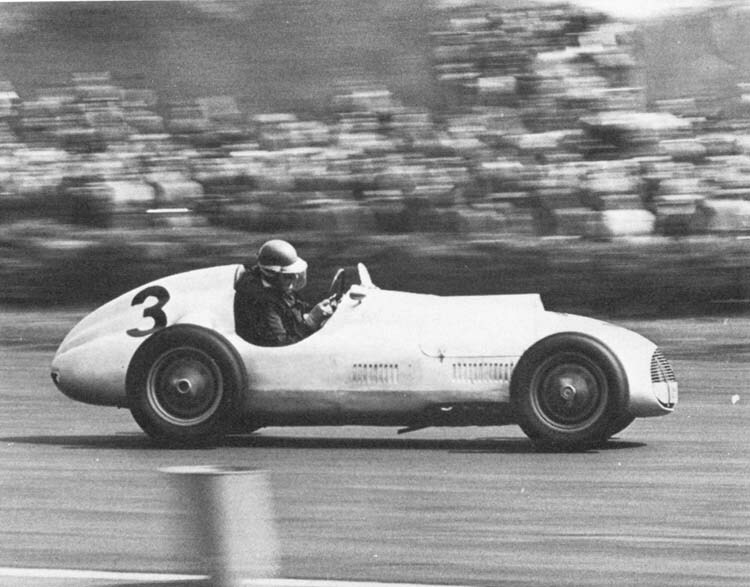 In 1950 boost was raised to 20psi and output went up to 350BHP@8500RPM. Up to that point only 9 engines of this type were ever produced. 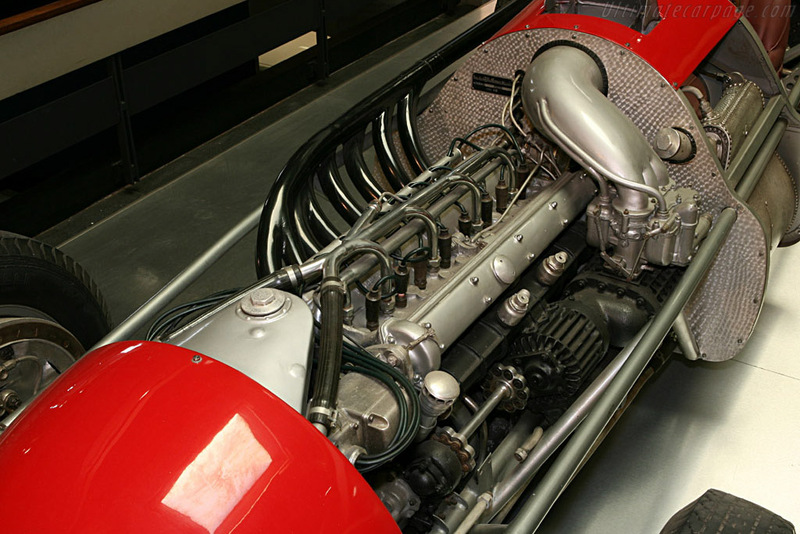 In 1951 Alfa Romeo extracted yet more power reliability from the straight eight, depending on Shell’s 98.5 percent-methanol Dynamin fuel as a coolant for pistons and valves. 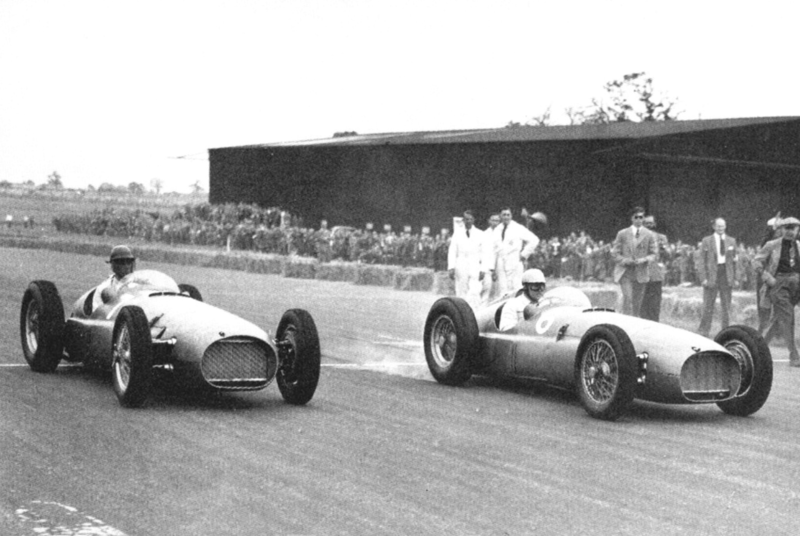 Valve overlap was made extreme to force a high-pressure through the head at TDC in what was like a ‘5th stroke’. The engines were burning more than 150 litres per 100km by 1951. More boost, up to 30psi allowed the engine to develop 420BHP@9300RPM, well over double the original output. The power required to drive the superchargers was 135BHP. BHP per litre 283.9BHP per litre. Just a reminder to everyone that this is Stivala's list, not mine. I just post and fish for images. How come that this engine, without any basic design changes at, say, the combustion elements level, could tolerate a doubling of power over the years? I am assuming that it was not overdesigned by that much, so which changes (materials, etc) allowed for this extreme increase in output without destroying the engine block or other parts? fabricated construction ? - but iirc the 158-9 not so ? Last edited by Tommy Cookers on Sun Jan 27, 2019 4:55 pm, edited 1 time in total. 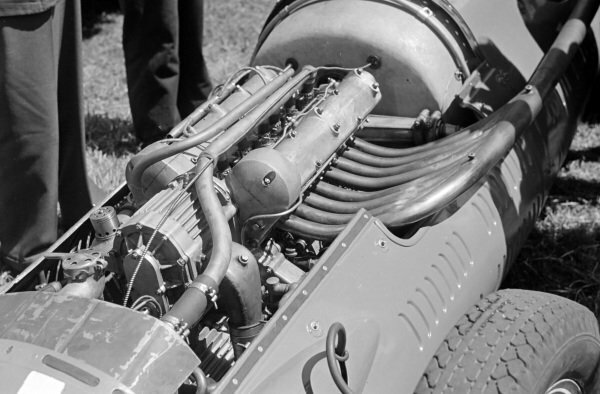 The world famous Alfa tipo 308 design was inspired by the other world finest ever Delage 15-S-8, But this design flourished on simplicity of design, and it was this design simplicity that saved the cracks developed on the crankcases between the upper studs holding the cylinder blocks and the lower studs holding the main bearing caps to be fixed and re used, this was done by simply removing both studs, drilling right through and using one stud to hold all together, and in my book that is not called ‘fish-plating’. The 308 biggest asset was its compact combustion chamber. Of that 135 HP, approximately 64 would be recovered due to 30 psi intake pressure driving the pistons down during the intake stroke. ...... in my book that is not called ‘fish-plating’. Pre-war only 4 were build. Cylinders were threaded-in cylinder block/head casting which in turn were held down to top part of crankcase by studs, the cracks developed between these studs and main bearing studs, which by design were inline, so studs that were for cylinder block and studs for main bearing caps were removed, holes drilled through and only one set of studs was used to hold both cylinder block and main bearing caps together, and that is certainly no fishplate. 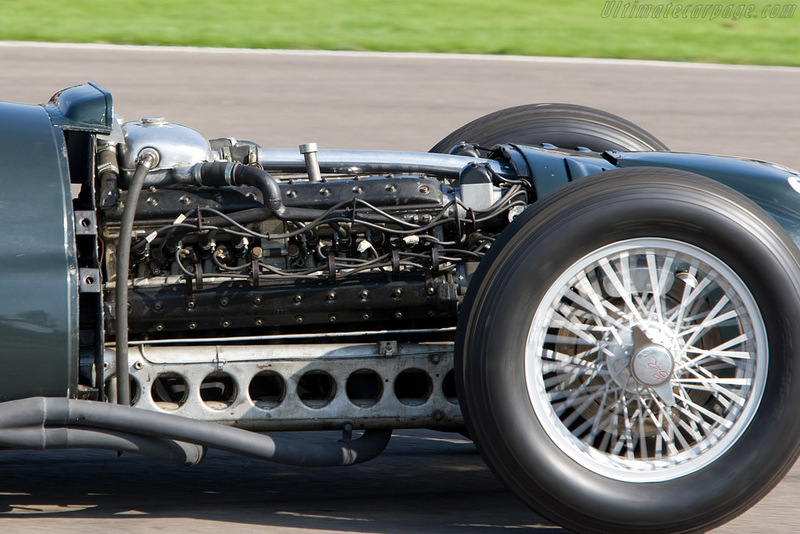 1951 BRM type 15 1.5-litre V16, “The engine sound that stands above all engines sounds”: Packing no more than 1500cc into no less than 16 cylinders, the smallest diameter pistons ever used in GP car racing as far as I know. Arranged in a 135 degree vee angle which gave even firing intervals and excellent balance, having enough potential to defeat anything else that comes its way. A brave goal target speed of 12000RPM for 1947. High supercharging boost pressure was responsibility of Rolls Royce. The gear drive up to cams and down and back out to clutch was from center of 2 crankshafts jointed together and running in 10 plain bearings with caps tied into the supporting webs by cross-bolts. 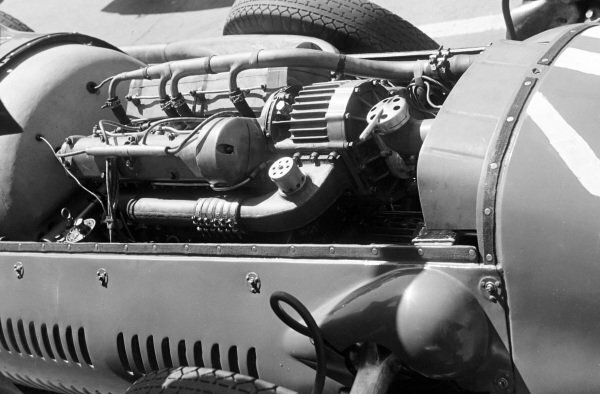 The center gear drive divided the engine into 2-750cc 135 degree V8 engines placed end to end with 2 crankshafts and eight camshafts sections each short and stiff. Single Cylinder block casting in RR50 aluminum alloy high-tensile cast iron wet cylinder liners held down against neoprene rings by detachable cylinder head against a flange at top of liner. When the crankshaft was spinning at 10000RPM the hollow power-out shaft to clutch was doing 5200RPM, normal rate for drive-line of that time. For this power-out shaft to rotate clockwise the engine had to rotate counter clockwise. This sub-shaft ran in a deep magnesium casting that formed the bulk of the engine and incorporated chassis mounts and the accessory drives as well as serving as oil collector for the dry sump. Spiral gears from sub-shaft drove 2 transverse shafts powering 4 pressure and scavenge pumps as well as the water pumps. Still form bellow this sub-shaft another shaft driven at 1.285 times crankshaft speed went forward to yet another pair of step-up gears that drove the superchargers at the front of the engine. This shaft was designed to flex in torsion. The 2 stage superchargers had a nickel-steel impeller, 6 inch diameter in the first stage and 5 ½ inch in the second stage. 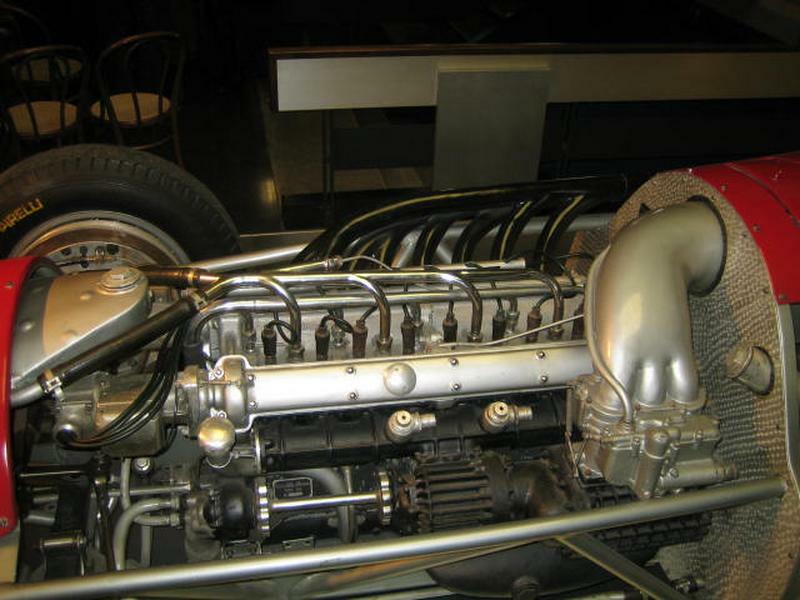 The 4 separate cylinder heads were cast of RR53 aluminum alloy, combustion chambers were hemispheres with valves symmetrically inclined at 90 degrees included angle. The exhaust valve guides were wet and were finned where they contacted the cooling water. Hairpin valve springs were used as was finger cam followers. Firing each cylinder through a small aperture was 14mm lodge spark plugs, sparks generated by battery powered coil ignition system. A 4 cylinder distributor was driven from the front of each cam and supplied with its own spark coil. Each distributor had 3 sets of points, one made contact, one broke it and one (manually selected) gave a retard timing for starting the engine. Persistent and frustrating engine failures were traced to flawed design in liner to head sealing. Valve opening duration 300 degrees. BHP per litre 289.1 per litre. Engine weight per BHP 1.55kg/BHP. Possibly the most fascinating engine and story of all time. Possibly yes, the story behind the type 15, the technicalities, the complexities the sheer amount of people involved in its masking, the in-build design fault, all of which unfortunately lead to one of the biggest engine flops of all time. The one coming up next in the series is the totally opposed extreme, very little is known about it including the name, just one individual man is involved, he made just 3 of them in his own workshop all by himself, for someone who could not collect them, this was a case of extreme engineering ingenuity, so extreme that it is said that this genius even had to make the rollers for the crankshaft bearing himself, this individual produced a 2-litre V8 engine with an output that the big guns of the time could not match. Till it comes up. Ingenuity at its best. 1952 Küchen 2-litre V8 most powerful GP engine of its time. Just 3 were build for formula 2 by an engineer in his own workshop and as a hobby. Delivering 200 HP something that could only be reached 2 years later by the likes of FERRARI and Maserati. 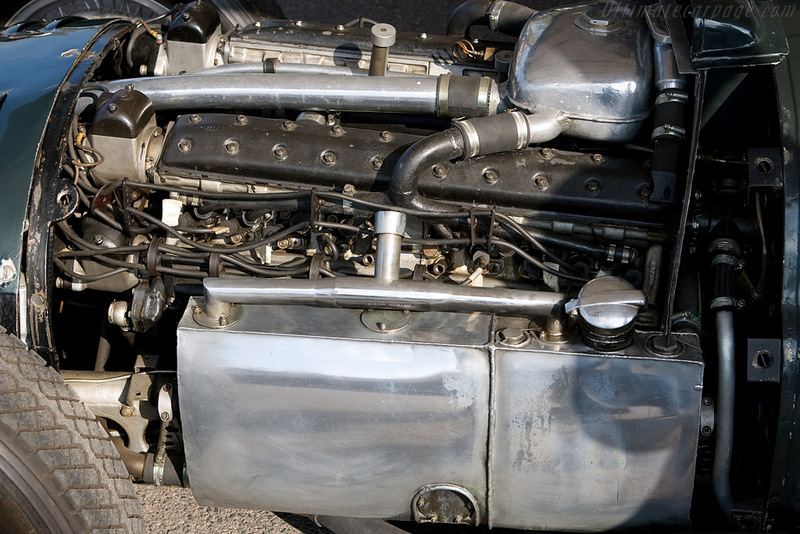 At 98kg it was the first water cooled engine to get the nearest to produce one HP per pound. A crankcase of silicon-aluminum alloy in 2 pieces split horizontally at crank centerline. 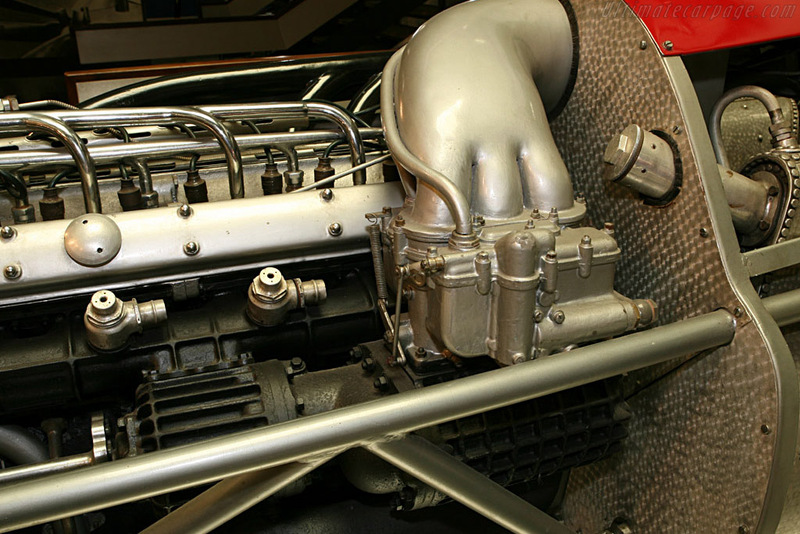 The upper half extending to the bottom of the cylinders, finned lower half and sealed by a finned casting cover which sloped to center oil pick-up for dry sump system. Hirth build-up crankshaft running in one piece single-row roller bearings with double row at back side plus a ball-bearing to take-up trust loadings. Oil through tubular gallery running along bottom of main bearing caps. Lips on outer main bearings rings directed escaping oil to slinger rings on crank cheeks to reach journal bearings. Küchen even made his own rollers for his bearings. One piece con-rods. Internally tapered gudgeon-pins in pistons secured by circlips. Pistons forged by Mahle. 3 compression rings and 1 oil ring. Wet Chrome-nickel steel straight tubes chrome plated cylinder barrels externally threaded at top screwed directly into cylinder heads combustion chambers. A water jacket around the liners was bolted to cylinder head for sealing at top. Protruding through holes in bottom of water jacket the bottom end of cylinder barrels were threaded to allow steel ring-nuts to be tightened against water jacket and water sealing at bottom by o-ring. The complete cylinder head assembly was bolted to upper crankcase. Valves at an included angle of 74 degrees seating directly on cylinder head without inserts. 4 detachable camboxes 2 per head machined from a single casting bolted down over triple-coil valve springs which exerted 100kg per valve. Hollow camshafts 2 per head ran in 4 roller bearings each. a shaft ran the length of each cambox acting as the pivot for roller-tipped finger followers. Valve gear was trouble free up to 10000RPM. Twin gear train drives from crank to cams. Double scavenge and one pressure oil pump. Double outlet water pump. Gear driven Two Bosch distributors 2 plugs per cylinder placed wide apart and at a slight included angle. 8 28mm Amal carburettors as well as a pair of two-throat 32mm downdraught Webers were used. Valve included angle 74 degrees. Inlet opens 50 degrees BTDC. Inlet closes 78 degrees ATDC. Exhaust opens 78 degrees BBDC. Exhaust closes 50 degrees ATDC. Piston speed (corrected) 17.9 m/s. The picture above is described in the link as a 1950 küchen. Let me know if the picture is wrong!